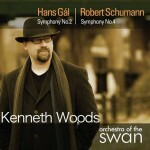 Kenneth Woods’ and Orchestra of the Swan’s world-premiere recording of Hans Gál’s Symphony No. 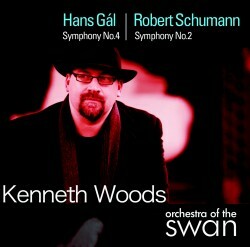 3, coupled with Schumann’s Third (AV 2230, was one of the most lauded classical releases of 2011. With features on National Public Radio’s All Things Considered and Performance Today, in Gramophone and BBC Music Magazine, and dozens of newspaper and online reviews, a new generation is discovering and seeking out Gál’s wide-ranging and extensive oeuvre. Ken, a prolific blogger, further stokes the interest with his extensive posts on A View from the Podium, one of the 25 most read classical blogs in the world. Woods and OOTS continue their cycle which pairs these two composers, with the world-premiere of Gál’s Fourth and Schumann’s Second. Written in his ninth decade and premiered in 1975, Gál’s Fourth and final Symphony is scored for chamber orchestra and akin to a concerto grosso. The music exhibits Gál’s trademark pastoral and lyrical style, yet inwardly this is music of intense rigor and deep concentration. While Gál’s compositional pedigree is strongly linked to the Austro-German tradition of the Viennese classical masters, Schumann’s Second looks to an earlier era, taking much inspiration from the spirit of J.S. Bach with its contrapuntal textures and chorale themes.